Bentley CEO Wolfgang Durheimer introduces the experimental EXP 10 Speed 6 during a Volkswagen Group event on Monday. 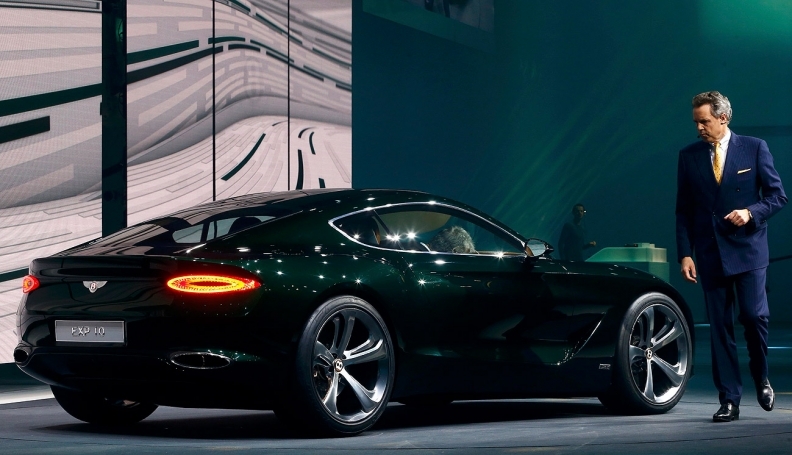 GENEVA -- Bentley unveiled the EXP 10 Speed 6 concept for a two-seat luxury sports car that it says may join its lineup in the near future. The EXP 10 shows how the brand's styling will evolve to become sportier and more emotionally appealing, Bentley said. If approved, a production version of the concept would be the brand's fifth model and would launch after the Bentayga SUV, Bentley's fourth model, which will go on sale next year. The EXP 10 was unveiled Monday at at press event held here by Bentley parent Volkswagen Group. The showcar has the potential to be the new pinnacle luxury two-seat sports car, Bentley CEO Wolfgang Duerheimer said. "It could be a future model line, alongside the Continental GT," he said. An EXP 10 production version would have a similar price to the Continental GT if it is built, Duerheimer told Automotive News Europe. The production car could be built on a lighter weight, front-engined platform developed by Porsche, another VW Group brand . A production EXP 10 would compete against two-seat sports cars from Ferrari and Aston Martin. The EXP 10 gets its initial letters from "experimental." Previous Speed 6 Bentleys were previously named for their straight six cylinder engines. Bentley has not released details of the EXP 10's powertrain. Bentley is expanding its model lineup as its seeks to double annual vehicle sales to 20,000 by 2020. The brand's global sales increased by 9 percent last year to a record 11,020. Bentley currently sells the Continental Flying Spur four-door sedan, Continental GT coupe and the flagship Mulsanne sedan.